Gili Meno is the most-loved island in the Gilis. But it’s not just for honeymooning couples and families with young children, it’s the perfect paradise island for the solo traveller looking for a Robinson Crusoe moment. The most untouched and underdeveloped of the Gili islands is blissfully peaceful in contrast to Gili Trawangan and Gili Air. Gili Meno also has the best powder white beaches and calmest, cleanest waters in the Gili islands. You’ll want to do little else but read a book, have a siesta in a cabana and wade in the bath-like ocean. At some point, you’ll want to explore the island. Walk around the island, stumble on local villages, and visit the Bird Park and Gili Meno’s salt lake. Then reward yourself with a sunset tipple at one of Gili Meno’s beach bars. Does this sound like a place that’s calling out to you? Let’s help you find the perfect place to stay in paradise. Here’s a curated selection of the top 13 villas, resorts and bungalow accommodation in Gili Meno. Gili Meno’s boutique resorts are not to be missed, especially if you’re on your honeymoon, or if you’re looking for a place where you can unwind, treat yourself to the best that Gili Meno has to offer, and get completely spoilt. Gili Meno’s resort developments are new, ultra stylish and cater to everything you could possibly need for that well-deserved desert island escape. The Reef Gili Meno is the most standout beach resort in Gili Meno. Although, perhaps not for much longer. There’s a pretty stylish villa resort being developed on the paradise island as we speak. We’ll keep you posted.. Back to The Reef. Located close to the boat landing with a breezy restaurant, oceanfront cabanas and stylish take on a Lumbung bungalow, plus a beachfront spa — and immaculate service to top it all off.. it’s a double dose of paradise. 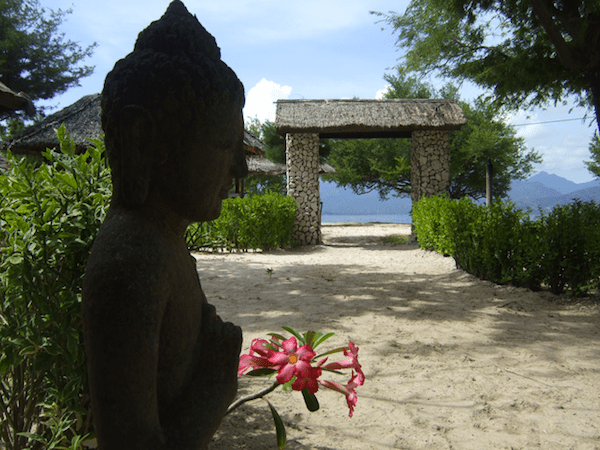 Mahamaya is a boutique resort in Gili Meno that was created with romance and lovers in mind. Here, you’ll find the most romantic tables on the island. Covered in white linen and set right on the oceanfront with a scattering of flower petals in the soft sand and illuminated by soft candlelight. We can’t think of a better place to propose, celebrate being a newly wed, or simply offer a romantic gesture to your loved one. InGili.com brings you the exclusive on BASK Gili Meno, a luxury beachfront development featuring a clutch of private boutique villas. Now you can own your very own slice of paradise. That’s all we can tell you for now. In the meantime, here’s a sneak peak of this divine resort located in ultimate paradise. 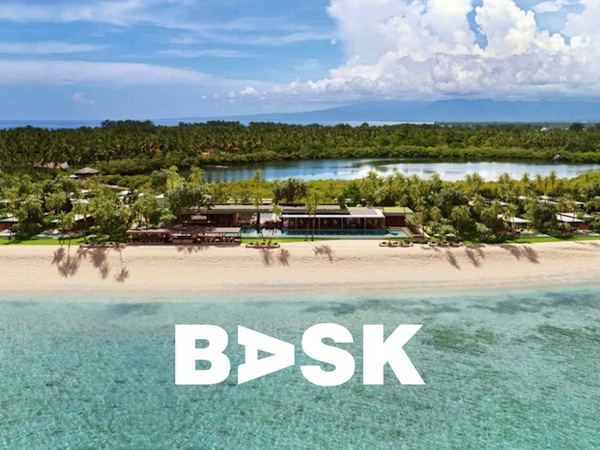 Find out more about BASK Gili Meno and join the mailing list to be among the first to find out more about this exciting luxury beachfront development in Gili Meno. Not as fancy as Gili Meno’s new boutique resorts but easier on the pocket, these island resorts offer fantastic value. Service, while not always timely, is charming, friendly and always reliable. In low season, a stay in one of these idyllic resorts costs the same as a bungalow in high season. Visit Gili Meno on the fringes of high season and score yourself a good deal. 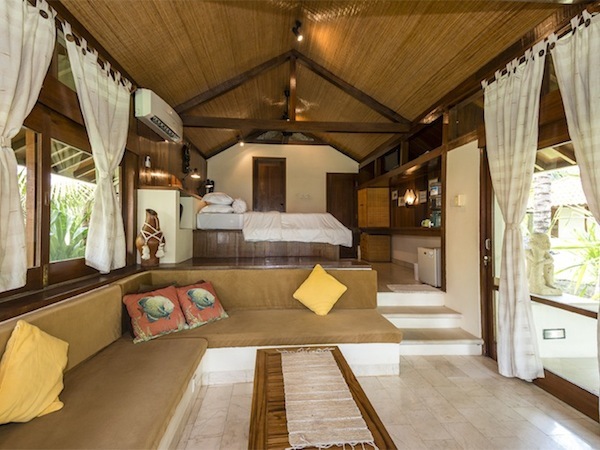 Opened in June 2012, located on the southwest corner of Gili Meno and just a five minute stroll to the beach, this cluster of wonderful island bungalows is surrounded by nature. The Rose Room and Sweet Lumbung are highly recommended by honeymooning couples to the romantic paradise island. The resort also offers cooking classes, so that you can take the taste and flavours of Gili Meno home, as well as indulgent massages in an outdoor spa pavilion. And to top it all off, you’ll dine in an open kitchen restaurant. Bliss! Ten luxury bungalows set in a tropical garden with sunny garden views and a sparkling swimming pool, at your service. Because when you’re on a tropical island holiday, you don’t have to choose between a dip in the ocean, and a late-night tipple in the pool. You get to have both. 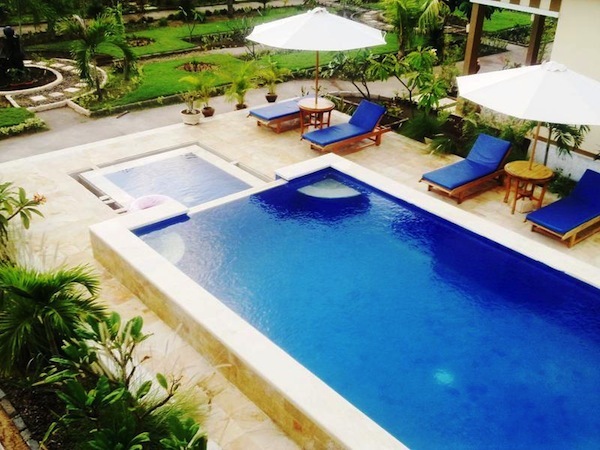 This newly built and family owned and operated resort in Gili Meno has a lovely pool and is perfect for couples. Just a five-minute walk from Gili Meno’s salt lake, take a leisurely stroll around the lake in morning or evening, you’ll be blown away at the biodiversity of flora and fauna in this small ecosystem, on this small island. With just 10 rooms, this charming resort set amongst coconut palms offers an alternative to staying in a beach bungalow. Villas in Gili Meno are not the most popular style of accommodation in Gili Meno, compared to Gili Trawangan where private holiday villas are cropping up everywhere. 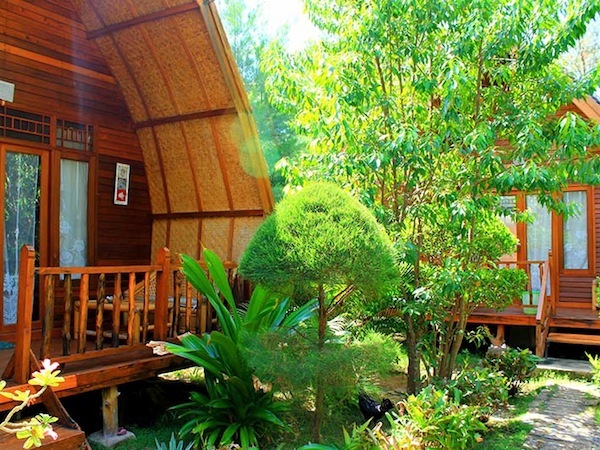 We found just two quintessential island villas in Gili Meno, both for under US$100 per night. 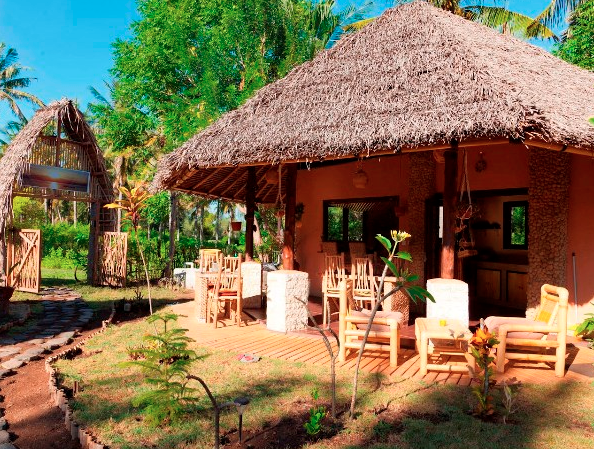 For just a little bit more, you could stay in one of Gili Meno’s boutique resorts. But that depends on what you like, and of course, how long you’re staying for. A wonderful stay in a beachfront villa in Gili Meno is a must for any visitor to the island. If you’re looking to create the perfect desert island holiday memories, then this might just be the place for you. Five villas sit on a 50-meter stretch of spectacular beachfront along the east coast of Gili Meno. Their oceanfront Bibi’s Cafe offers quintessential island dining. On the menu: the usual chorus of Sasak-style Indonesian fare, and Gili Meno’s signature pizzas. For those island days when moving is not an option. Villa Nautilus, Gili Meno, email: enquiries@villanautilus.com. Rates start at US$79 per night in low season. Visit their website at www.villanautilus.com. 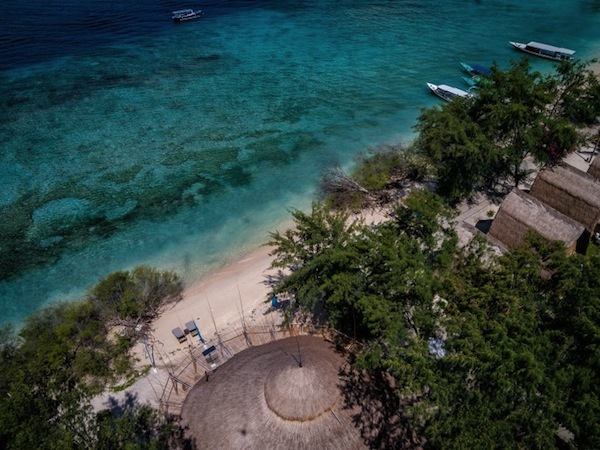 A castaway island holiday in Gili Meno has to be about waking up as close to the beach as possible, and falling asleep to the gentle lap of the waves on the shore. Villa Melati is a beautiful oceanfront island villa. 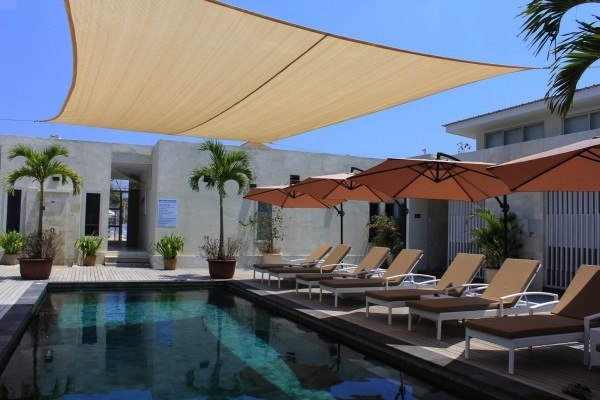 Relax on a large gazebo and day bed in the hotter hours of the day. After a sunset walk, return to your sanctuary and reflect over a spectacular vista of Mount Rinjani and Lombok from your private gazebo, right on the beach. What we love about this place the most: Sublime privacy. The villa accommodates just two people in one breezy bedroom. Book Villa Melati Gili Meno in AirBnB for Rp1057226 per night at www.airbnb.com/rooms/4033914 or email infovillamelati@gmail.com. There are many beach bungalow accommodations in Gili Meno for it’s size, however in high season, it all fills up pretty fast. We highly recommend making a booking than risk roaming around the island with your heavy backpack to look for a place. You won’t get a good deal either that way, unless you’re a really good negotiator. And even then, you’ll probably cave under the blistering heat.. In high season, a good beach bungalow that has air-con and a hot shower will cost at least IDR600,000 and IDR450,000 without aircon. Adeng-Adeng means slowly-slowly in Bahasa. As the name suggests, it’s a place to relax, return to nature and retreat in the privacy and serenity of a tropical garden. Great for travellers seeking a laid back atmosphere. 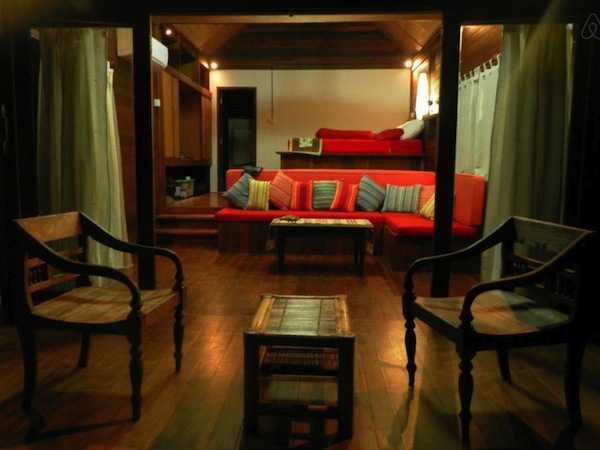 Their one bedroom bungalows accommodate two people for as low as US$60 per night. They also have a two bedroom bungalow that accommodates four people and is perfect for families. Rates for the two bedroom bungalow are as low was US$115 per night on their website. 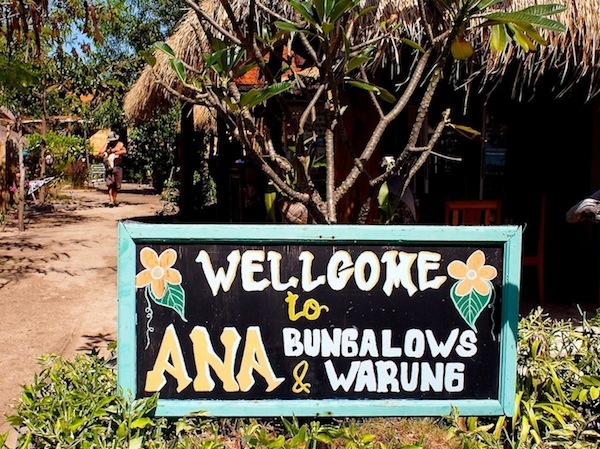 Ana Warung and Bungalows is a cluster of new, traditional Sasak style bungalows that offers travellers two options; Padang bungalows constructed from bamboo and alang alang roofs and air-conditioned bungalows. The real highlight of Ana Warung and Bungalows is a two storey beer house, where you can sip a G&T with a bird’s eye view of the water horizon at dusk. Simply sublime! 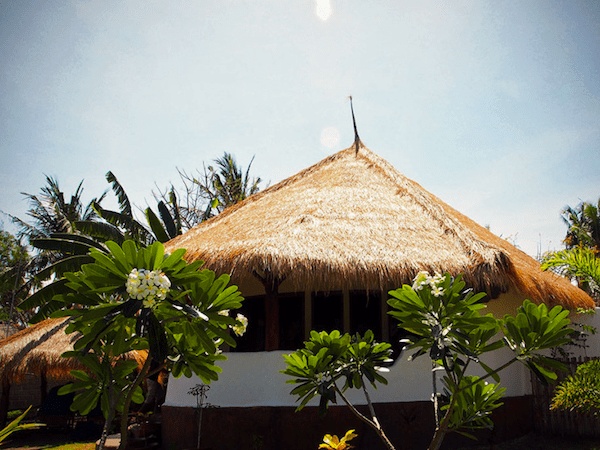 Ana Warung & Bungalows, Gili Meno, Tel: +62 0878 6169 6315 or email: bookings@anawarung.com. Visit their website at www.anawarung.com. A small and quaint bungalow resort that’s perfect for the solo traveller who wants to stay off Gili Meno’s beaten track and yet still be right on the beach. Ten bungalows with air-con and private terraces with bamboo sofas and cold-water showers. Its rustic island living at it’s finest. 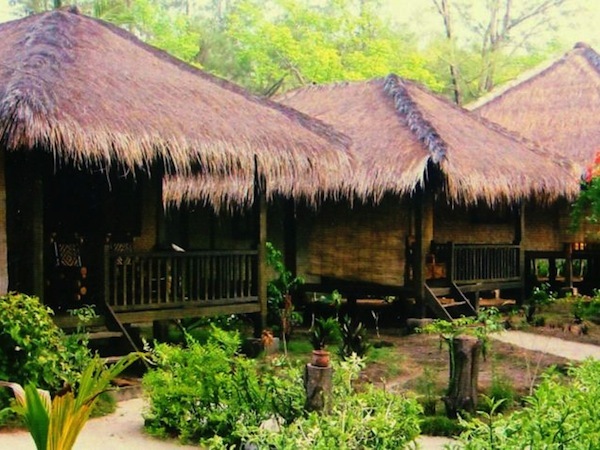 Right next to Ana Warung and Bungalows is Blue Coral Bungalows. And older but equally charming Gili Meno accommodation. Bookings are made on a walk-in basis, which means there’s usually some bargaining involved. If the island is busy, expect to pay US$40 a night, which for the same price, you can stay in the newer bungalows next door. How much you should really pay: US$20-25. Jepun Bungalows in Gili Meno features six breezy Lumbung bungalows (rates from US$35 to US$45 a night) and 2 modern air-conditioned rooms (rates from US$40 to US$60 a night). And if you’re getting to the Gilis from Amed in East Bali, check out their sister resort at www.jepundidulu.com. If you’re planning to wing it and head straight out to the island and find even cheaper accommodation in Gili Meno, it’s possible, but we have to warn you that you’ll be roughing it under the US$40 mark. Besides, you’ve come all this way to get to paradise. Treat yourself. Also, prepare to completely switch off from the world when you come to Gili Meno. Internet connections are not the best. You’re on a deserted island after all. There’s enough of a signal to check your emails and Facebook periodically, but you may as well use this as an excuse to log off completely and recharge your own batteries.